The Global Volcanism Program has no activity reports for Santa Cruz. The Global Volcanism Program has no Weekly Reports available for Santa Cruz. The Global Volcanism Program has no Bulletin Reports available for Santa Cruz. The highlands of the broad Santa Cruz shield volcano rise to the N above the Charles Darwin Research Station at Academy Bay. The oval-shaped, 32 x 40-km-wide island is capped by youthful pit craters and cinder cones with well-preserved craters that largely bury a shallow summit caldera. Older uplifted submarine lava flows are found on the NE part of the island and at the fault-delimited offshore island of Baltra. The highland scoria cones are grouped along an E-W belt parallel to recent fault scarps that border Academy Bay. The youngest lava flows were erupted from vents along the summit fissure and on the N flank. Their fresh morphology and sparsely vegetated surfaces suggest they may be only a few thousand years old, although their ages are not known precisely. The Global Volcanism Program is not aware of any Holocene eruptions from Santa Cruz. If this volcano has had large eruptions (VEI >= 4) prior to 10,000 years ago, information might be found on the Santa Cruz page in the LaMEVE (Large Magnitude Explosive Volcanic Eruptions) database, a part of the Volcano Global Risk Identification and Analysis Project (VOGRIPA). There is no Deformation History data available for Santa Cruz. There is no Emissions History data available for Santa Cruz. The highlands of the broad Santa Cruz shield volcano, seen here from the NE, are capped by youthful cinder cones with well-preserved craters. The scoria cones are grouped in an E-W belt parallel to recent fault scarps that border Academy Bay and largely bury a shallow summit caldera. Older uplifted submarine lava flows are found on the NE part of the island and at the fault-delimited offshore island of Baltra. 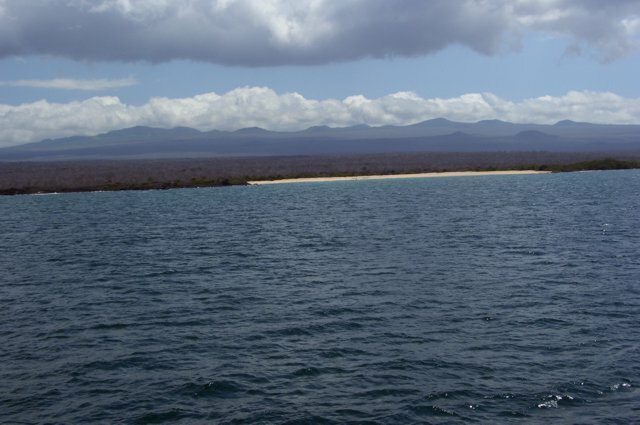 No historical eruptions are known from Santa Cruz, the 2nd-most populated island of the Galápagos archipelago. Lava flows line the steep walls of a pit crater on Santa Cruz island. Note the person standing on the rim at the right for scale. Pit craters are formed by collapse following the withdrawal of magma along a rift zone. They differ from other craters in that their rims lack a mantle of explosive debris. 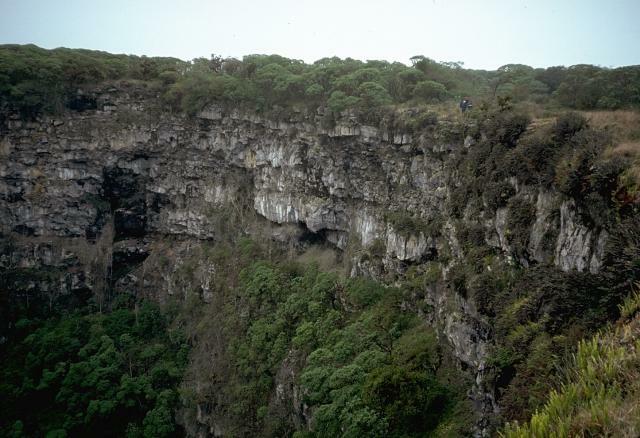 In some cases, vertical-walled pit craters can be hundreds of meters deep. 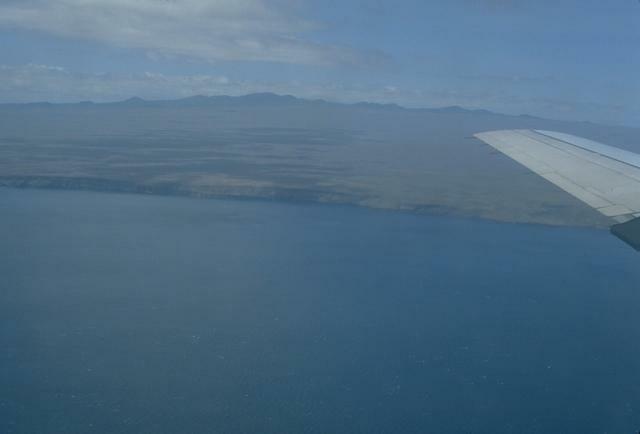 The broad shield volcano forming Santa Cruz Island is seen from its northern coast. The oval-shaped, 32 x 40 km wide island is capped by cinder cones with well-preserved craters that largely bury a shallow summit caldera. The highland scoria cones are grouped along an E-W belt parallel to recent fault scarps that border Academy Bay, location of the Charles Darwin Research Station. Photo by Lee Siebert, 2006 (Smithsonian Institution). Large Eruptions of Santa Cruz Information about large Quaternary eruptions (VEI >= 4) is cataloged in the Large Magnitude Explosive Volcanic Eruptions (LaMEVE) database of the Volcano Global Risk Identification and Analysis Project (VOGRIPA).